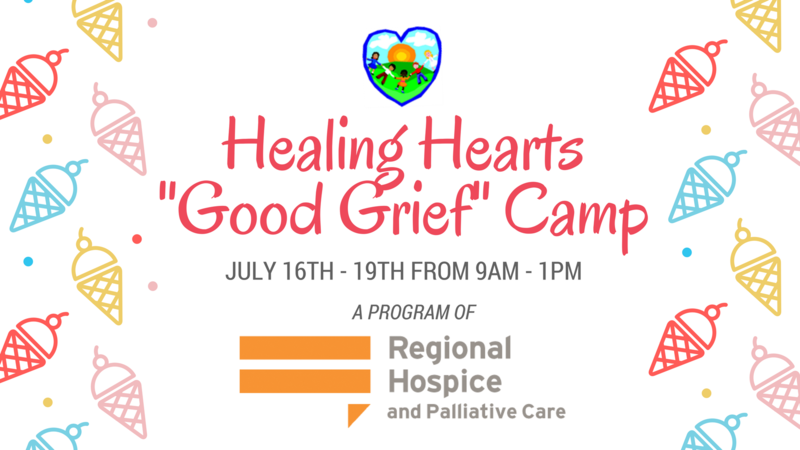 Healing Hearts Center for Grief and Loss is offering a four-day summer “Good Grief” camp program for children between the ages of 6 and 11 who have experienced the death of a parent, sibling or other significant family member. The camp is filled with fun, confidence-building activities combined with grief education and emotional support. Campers have an opportunity to tell their story, express their feelings and memorialize their loved ones. The camp runs from July 16th through 19th from 9 am -1 pm and is facilitated by grief professionals and trained volunteers. Camp will be held at the Regional Hospice and Palliative Care Center for Comfort Care and Healing, 30 Milestone Rd., Danbury, CT.
For more information, or to register a child for camp, please contact Joanna DeNicola, program manager, at 203-702-9152 or email jdenicola@regionalhospicect.org. The Healing Hearts Center for Grief and Loss is a program of Regional Hospice and Palliative Care, offering free support groups, workshops, and educational events to help children, teens and adults cope after the loss of a loved one. Regional Hospice and Palliative Care’s team of experienced clinicians have been providing physical, emotional, spiritual and bereavement support to children, adults and their families through our palliative and hospice care program for the past 30 years. Regional Hospice and Palliative Care is a nonprofit, state-licensed and Medicare-certified home health care and hospice agency. Now, with the opening of our new private-room, specialty hospital for palliative and end-of-life care — the Center for Comfort Care & Healing — Regional Hospice and Palliative Care can bring that same hope and compassionate care close to home and under one roof.